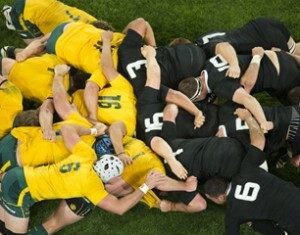 Rugby union is a full contact team sport, a form of football which originated in England in the early 19th century. One of the codes of rugby football, it is based on running with the ball in hand. It is played with an oval-shaped ball, outdoors on a level field, usually with a grass surface, up to 100 m long and 70 m wide. At each end of the field is an H-shaped goal. William Webb Ellis is often credited with the invention of running with the ball in hand in 1823 at Rugby School when he allegedly caught the ball while playing football and ran towards the opposition goal. 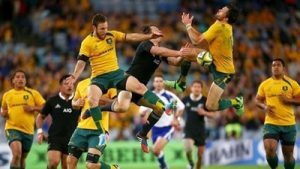 Bledisloe Cup - THE ultimate trans-Tasman rivalry is back at ANZ Stadium in 2018 when the Qantas Wallabies face the All Blacks in the opening game of the Bledisloe Cup. The new-look Qantas Wallabies will be out to defend home turf against the old enemy as they go on the hunt for Bledisloe glory. For further information on available packages please contact MaXXimus Australia.